Bundled up runners, including a turkey costume-clad trotter, wind their way through the trees for the 33rd annual Turkey Day 5K Thursday morning at the Glenwood Springs Golf Course. Henry Barth crosses the finish line to win the 32nd annual Turkey Day 5K Thursday at the Glenwood Springs Golf Course. 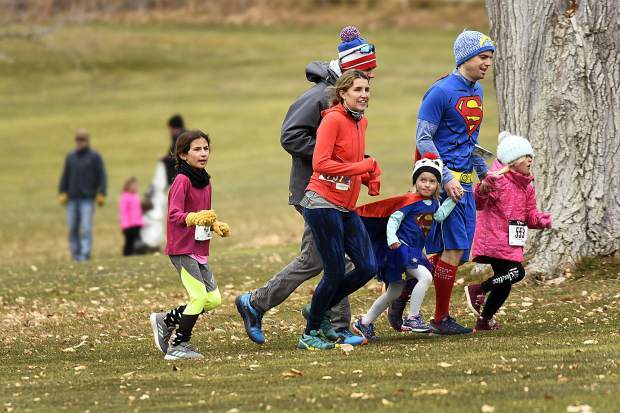 Supergirl and Superman make their way through the course during the 32nd annual Turkey Day 5K Thursday at the Glenwood Springs Golf Course. 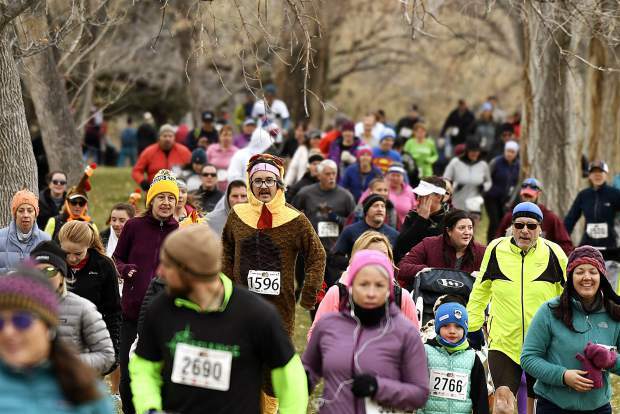 Participants enjoy the 32nd annual Turkey Day 5K Thursday at the Glenwood Springs Golf Course. 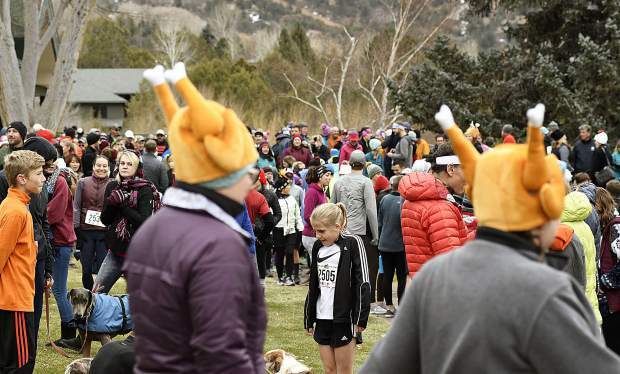 A throng of people gather near the clubhouse for the 32nd annual Turkey 5K Thursday at the Glenwood Springs Golf Course. A trio of runners have fun as they start the 32nd annual Turkey Day 5K Thursday at the Glenwood Springs Golf Course. Runners sprint to the finish of the 32nd annual Turkey Day 5K Thursday at the Glenwood Springs Golf Course. Wes Toews prepares for the 32nd annual Turkey Day 5K Thursday at the Glenwood Springs Golf Course. A runner tries to catch his breath after finishing the 32nd annual Turkey Day 5K Thursday at the Glenwood Springs Golf Course. 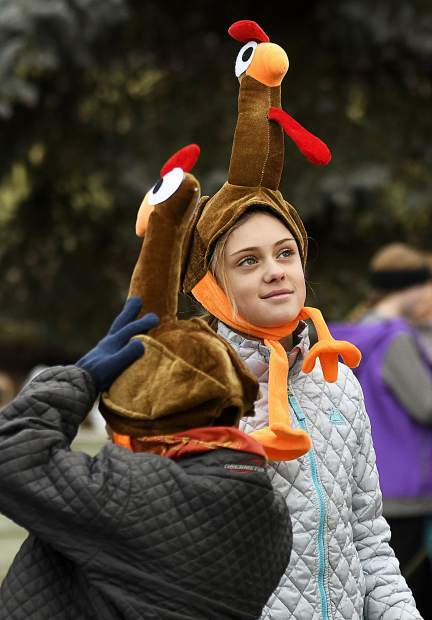 Participants get into the holiday spirit as they wait for the start of the 32nd annual Thanksgiving 5K Thursday at the Glenwood Springs Golf Course. 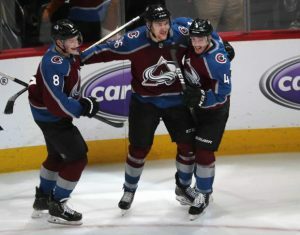 During the Thanksgiving holiday season, many families are scurrying to try and get out of town quickly to avoid the inevitable jam-up on the freeways, or they are hustling and bustling to crowd their way to the front of long and frenzied lines at the airports. The goal is often to get to grandma and grandpa’s house for the big turkey feast with as little hassle and disruption as possible. 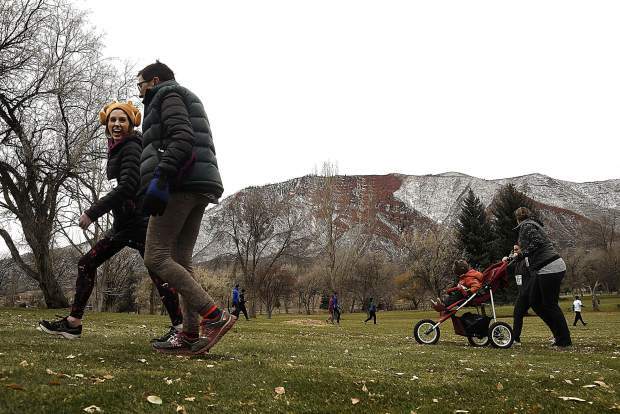 None of these holiday headaches was even a slight consideration for the 525 jovial revelers who made the 32nd annual Turkey Day 5K Run/Walk their activity of choice on a cloudy and cold Thursday morning in Glenwood Springs. 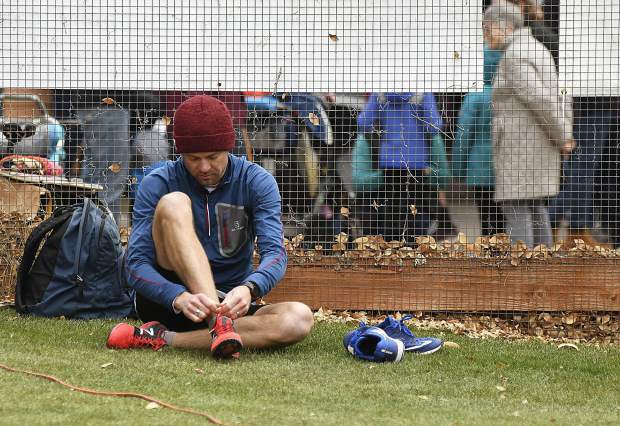 Yes, there was indeed some hurrying and scurrying, as well as hustling and bustling at the Glenwood Springs Golf Course, the site of the annual 3.1 mile festival of fitness. But the destination wasn’t a front-and-center seat at the overloaded family dinner table. 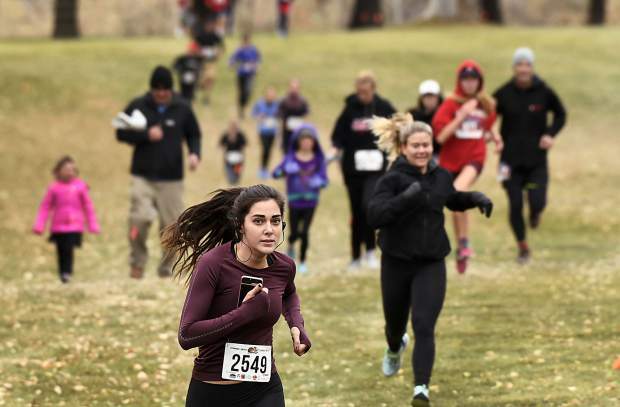 There most certainly is a competitive side to the Turkey Day 5K, which attracts one of the more formidable gatherings of runners on the Western Slope each year. This year’s contest proved to be no exception. 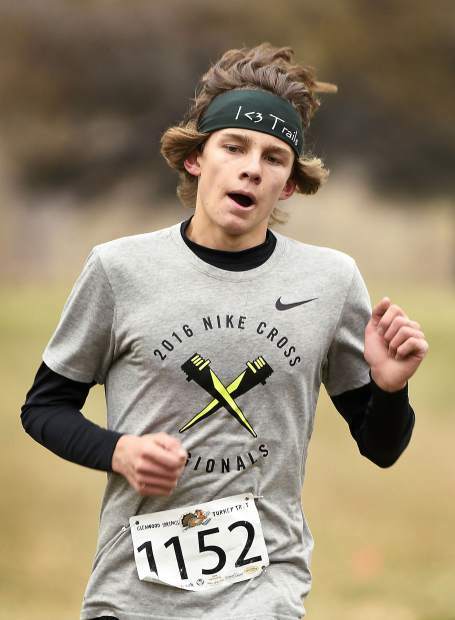 Glenwood Springs High School all-stater Henry Barth blazed the trail to victory in a stellar 17 minutes, 51 seconds time to best the large contingent of runners on America’s holiday. 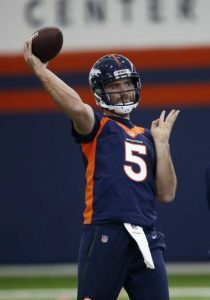 Barth was thrilled with his victory, but he was most appreciative of his big win in one of Glenwood’s most historic races. 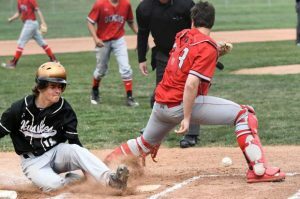 Barth, who will compete in track this spring for Coach Blake Risner’s Glenwood Track and Field Demons, will have a choice of suitors when it comes to his college choice of running and educational opportunities. 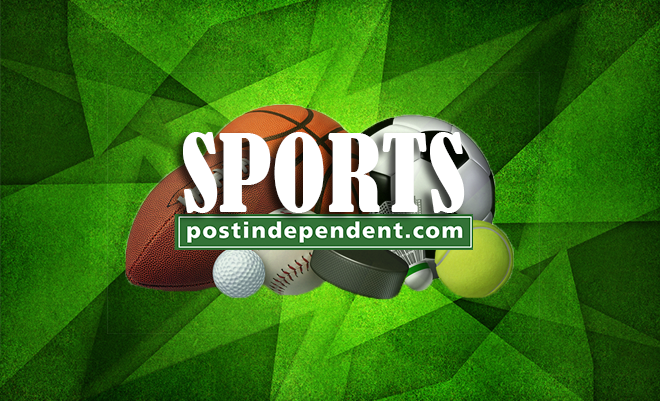 Second overall was Wesley Toews of New Castle, posting a time of 18:09, with third place overall going to Ryan Wilch at 19:42, followed by Glenwood’s Charlie Wertheim coming to the finish tape at 20:48. Mathew Thrun of Glenwood took fifth place in the stacked field of Turkey Day harriers with a time of 21:55. Rounding out the top 10 overall were Brad Snyder at 21:55, William Wright with a time of 22:04, Glenwood High School senior track standout Bryce Risner in 22:07, New Castle’s Josh Cullen in 22:17, Ben Luck with an identical time of 22:17, and 14-year old Cooper Luetke in 10th place at 22:25. New Castle’s Kelley Cullen, a fitness instructor at the Hot Springs Pool and Aspen Glen was the women’s winner by recording a solid 23:07 at the finish line, with Morgan Hill coming to the end of her running journey in 23:43 to take second overall for the ladies. Glenwood Middle School seventh-grader Sydney Schriock was third in the girls’ category with a commendable time of 24:40. And, Riverview Middle Schooler Taia Nykerk was close behind at 24:41 for fourth among the females. The most impressive finisher of the day may have been 39-year old Linsey Harden of Glenwood Springs. Harden, whose son Gavin was a standout runner for the Glenwood cross country team this fall, was running her first-ever 5K. Her completion of the annual event was a partnership with her son for his senior year Capstone Project at Glenwood High School to fulfill his graduation requirements. The final area running event of 2018 will take place in Carbondale on Sunday, Dec. 16. Independence Run and Hike will once again play host to the annual Jingle Bell 5K Run/Walk to close out the racing season. 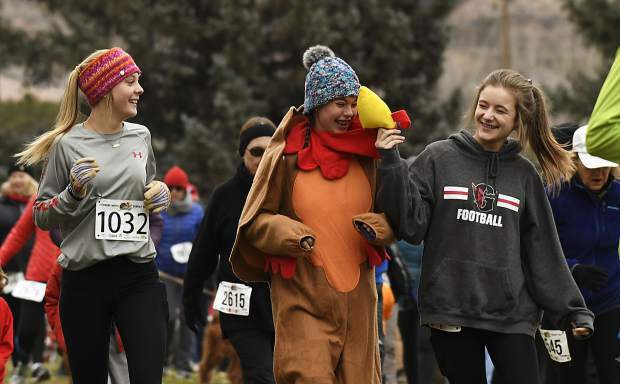 In addition to the well-established Thanksgiving Day race in Glenwood Springs, similar 5K run/walk events of more-recent mint took place Thursday in Rifle, Carbondale and Basalt.